Succinate dehydrogenase (SDH) is an enzyme complex, composed of four protein subunits, that plays a role in both the citric acid cycle and the electron transport chain. The genes for SDHA, SDHB, SDHC, and SDHD are located in the nuclear DNA, and mutations in these genes have initially been described in paragangliomas (PGL) and pheochromocytomas (PCC), which are relatively rare tumors derived from the autonomic nervous system and the adrenal medulla, respectively. Patients with SDH mutations, that are almost exclusively in the germline, are frequently affected by multiple PGL and/or PCC. In addition, other tumors have been associated with SDH mutations as well, including gastrointestinal stromal tumors, SDH-deficient renal cell carcinoma, and pituitary adenomas. 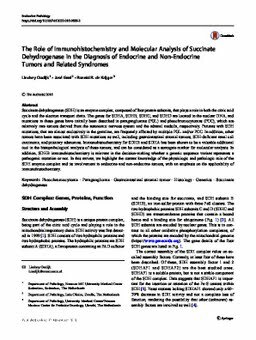 Immunohistochemistry for SDHB and SDHA has been shown to be a valuable additional tool in the histopathological analysis of these tumors, and can be considered as a surrogate marker for molecular analysis. In addition, SDHB immunohistochemistry is relevant in the decision-making whether a genetic sequence variant represents a pathogenic mutation or not. In this review, we highlight the current knowledge of the physiologic and pathologic role of the SDH enzyme complex and its involvement in endocrine and non-endocrine tumors, with an emphasis on the applicability of immunohistochemistry.